Check out Pets2Collect Magazine available in all good newsagents! Find out what's inside below! Get your hands on this purr-fectly pet-tastic magazine! 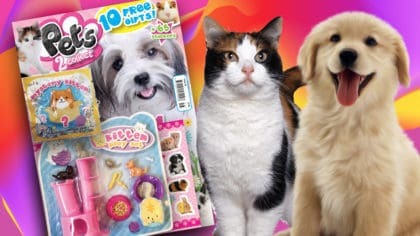 Pets2Collect is the only magazine that comes with a cute collectable animal gift set on every issue. Packed with cute animals and friendly family felines, Pets2Collect is perfect for every pet lover. Every issue of the magazine is packed with stories, puzzles, games, crafts, competitions and posters. There’s even practical and helpful advice on looking after all types of pets! As if that wasn’t enough, every day during Dan’s show, he’s sharing some animal facts from the magazine!